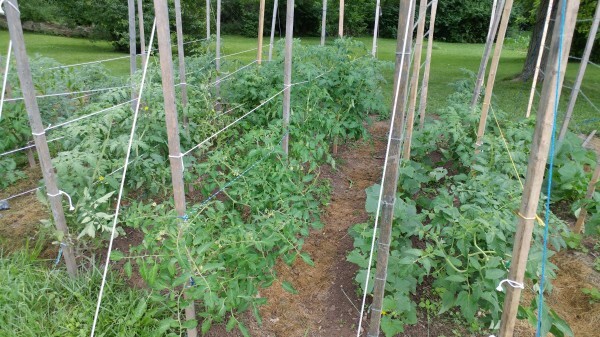 - Protect your tomatoes from soil-born diseases: During summer thunderstorms, dirty water can splash up on your tomato leaves and spread diseases, including fatal ones like late blight. You can help prevent these diseases by spreading a hay or grass clipping mulch around the base of the plant, and trimming off suckers and leaves from the plant’s bottom. Pruning the tomato plant in this manner also helps prevent disease by improving airflow. - Be on pest patrol: This includes four-legged, six-legged, and legless pests. Keep your eyes peeled daily for plant damage, and immediately address them in the way you feel comfortable. For example, you don’t have to kill rabbits to remove them, you can either put in a fence or live trap and move them. For bugs, there are scores of effective organic pesticides like neem oil. Or, you can just remove the bug and squash it, like tomato hornworms and Japanese beetles. - Keep your plants hydrated: The standard for plants is about an inch of water a week. If mother nature doesn’t provide it, then you need to. Always water the base of the plant, and try to avoid wetting the leaves, which can encourage diseases. Deep watering is best, and a soaker hose is a good option. - Kill the competition: Weeds provide cover for pests, block light, and compete with the good plants for food. Put on your favorite podcast or music on your earbuds and get to pulling them out. Take care to settle any dirt you disturb around the plants, and if you get the weeds before they go to seed, you can use them for green manure. If you haven’t been able to weed for a bit, you may find your younger plants flop over after clearing out the weeds. That’s fine, it’s because the weeds were their support, and they’ll recover. - Sow now for fall crops: Many fall crops, like broccoli, turnips, beets, beans, and cabbage, can be sowed in July. Take a look at what you’re planning to plant so you don’t miss any sowing time, as some plants need a set amount of days to reach maturity for harvest. A bonus: Many vegetables, especially root ones, taste even better after a good solid frost.